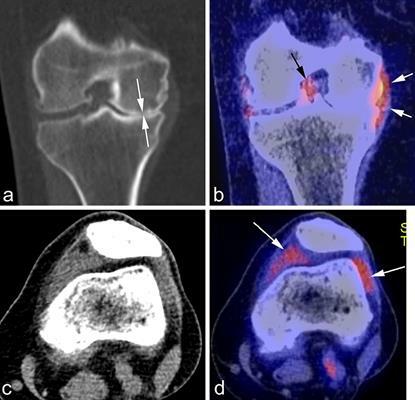 What does the future hold for imaging of osteoarthritis? January 2, 2019 -- Radiography, MRI, and ultrasound all have a role to play in osteoarthritis imaging, but what are the pros and cons of using each modality, and how is hybrid imaging likely to transform this area? Three international musculoskeletal experts provided some answers in a podcast released by the British Institute of Radiology, and we have outlined their main points for you here. "In the clinical setting, we start with an x-ray as the basis of a diagnosis, and depending on what we are looking for from the diagnostic perspective, we can move forward to MRI or ultrasound. That will be a little bit different if we are talking about immunological studies or clinical trials because it depends on what the compound for clinical trial is aiming for, or treating, and for epidemiological studies, most of the time we are looking at some simple changes in joint structures. We use x-ray for inclusion and assessment of osteophytes and joint space narrowing and MRI for looking at the tissues and more detailed feature changes," said Dr. Ali Guermazi, professor of radiology and medicine at Boston University School of Medicine in Massachusetts, U.S.
Compositional MRI has become increasingly important for evaluation of the early stage of osteoarthritis before morphological changes that can be depicted on conventional MRI occur, and dGEMRIC is one such technique. In this patient with knee pain, the coronal T1 gadolinium map shows degenerative a horizontal tear of the medial meniscus posterior horn (arrowhead) with low dGEMRIC index (suggesting the presence of compositional abnormality) in otherwise morphologically normal medial tibial plateau cartilage (arrows). Image courtesy of Dr. Daichi Hayashi. Digital x-ray is useful for a basic diagnosis in routine clinical practice and can help establish the structural diagnosis of osteoarthritis, according to Dr. Frank Roemer, radiologist and director of musculoskeletal research in the department of radiology at University of Erlangen in Germany. "Most of the time it is completely sufficient, but today MRI is coming more and more into routine practice," he said. "In joint replacement, now we have much more individualized surgery ... [when] planning a surgical approach, and sometimes dedicated MRI questions are being asked. For example, if you wanted to replace the medial side, is the lateral side intact? And how are the ligaments? Are these intact? These are questions that in recent years have come into clinical practice more than before." The traditional thinking for imaging of osteoarthritis was just to look at the x-ray and study the wear and tear of a cartilage, but now more is known about the pathophysiology of osteoarthritis, it is important to look at the tissues other than the bones and cartilage, including the synovial membrane, explained Dr. Daichi Hayashi, assistant professor of radiology at the Stony Brook University School of Medicine in New York. This means additional imaging with MRI and ultrasound is becoming more important in the clinical setting. "The problem with radiography is the lack of correlation with the patient's symptoms," Hayashi continued. "Because of the multiple inherent limitations of the radiograph, we need to move on and make a paradigm shift toward more advanced imaging rather than being primarily dependent upon x-ray." 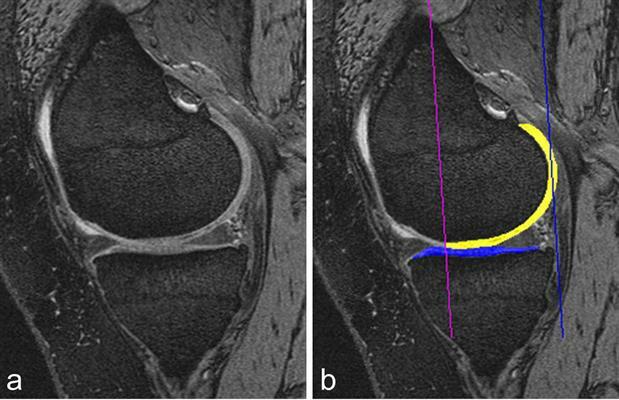 Cartilage quantification based on 3D MRI. A: Sagittal dual-echo at steady-state (DESS) MRI is commonly used for cartilage segmentation. Cartilage appears as a bright signal band between the subchondral bone and the intraarticular cavity. B: The femoral segmentation is color-coded in yellow and the tibial boundaries of cartilage are coded in blue. In addition, the subregional demarcations are shown (purple and blue lines). Image courtesy of Drs. Wolfgang Wirth and Felix Eckstein, Paracelsus Medical University in Salzburg, Austria, and the BJR. A major advantage of ultrasound over MRI is the ability to assess synovitis by means of color Doppler imaging without the use of intravenous contrast, Hayashi pointed out. Another benefit is the ease of doing the scan. Operator dependence is always a challenge, and there may be some limitations in reproducibility. However, rheumatologists and orthopedic specialists can perform ultrasound in their own clinics, especially in small joints of the hand. Hayashi teaches nonradiologists, particularly rheumatologists, how to scan these joints in daily practice. "I do think ultrasound still has a place here in the assessment of osteoarthritis, especially clinically," said Guermazi, who is also the founder and director of the Quantitative Imaging Center within the Boston University School of Medicine Department of Radiology. "It can be a little more problematic for clinical trials because you want the images to be in exactly the same spot, and it can be very difficult to reproduce the same images, especially for large joints. For small joints like the fingers, you can always use a systematic approach and get the same images, axial and longitudinal, for short axis and long axis." Ultrasound can assist with phenotyping, Guermazi added. If the patient appears to have inflammation, be it effusion or synovitis, then it is advisable to perform an ultrasound exam to investigate the thickening of the synovial membrane and determine if the thickening is inflammatory. Ultrasound has become a very important tool to assist with targeted treatment, and it is used increasingly to guide intra-articular injections, according to Roemer, who is also adjunct associate professor at Boston University and associate professor at the University of Erlangen. He thinks it's important to differentiate between ultrasound use in a clinical, therapeutic setting, where a patient is seeing a doctor or a physician, and its use for research endeavors, including large epidemiological, longitudinal studies, or clinical trials that are assessing the efficacy of a certain compound. "When it comes to a research setting, the limitation of ultrasound, particularly in regard to a large joint, is that the different joint tissues can only be marginally visualized, and that includes the subchondral bone," Roemer said. "Ultrasound is blind when it comes to showing changes in the subchondral bone, and deeper tissue changes or articular structures such as in the cruciate ligaments are just not visualized on ultrasound. These limitations must be kept in mind when it comes to showing changes in, for example, the patellofemoral joint. That is a different story because ultrasound is well able to show some cartilage changes with that part of the joint but not the entire knee joint." For quantitative and qualitative analyses using MRI, Roemer finds 3D morphometry particularly valuable. 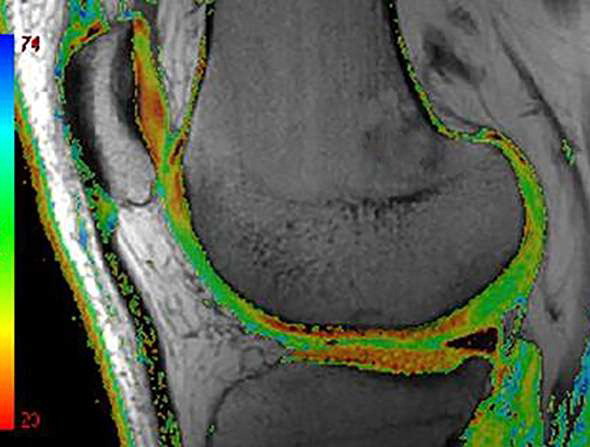 "This is based on tissue segmentation and is being widely used for cartilage quantification," he said. "The cartilage tissue is well contrasted between the intra-articular fluid and the subchondral bone. Regions of interests are drawn around the cartilage, and multiple parameters can be extracted from those 3D segmentations, including cartilage volume, cartilage thickness, the amount of the denoted bone area beneath the cartilage, and so on." Compositional MRI can depict intratissue structural alterations that are not visible to the human eye. Color-coded T2 map MRI shows areas of focal increase in T2 times as green areas. T2 relaxometry is the most commonly applied compositional technique because it is available on most clinical MRI platforms. Image courtesy of Dr. Daichi Hayashi et al and BJR. Compositional MRI techniques, including T2 mapping or T2 relaxometry, can be used to look at the ultrastructure of tissue. Basically, the different analytical approaches are semiquantitative, quantitative, and qualitative compositional measures of tissue change, Roemer noted. "The semiquantitive scoring system is mostly based on noncontrast-enhanced MRI, making it easily applicable to epidemiological studies," Hayashi added. "In these studies, the use of contrast is not so easy because of the potential, although very low, risk of side effects." Also, radiologists must keep aware of the dedicated semiquantitative scoring system for synovitis based on contrast-enhanced MRI. "It is important to use this scoring system that is based on contrast MRI," Hayashi said. "In rheumatoid arthritis, it is routine practice nowadays to use the contrast MRI for accurate assessment of synovitis. The same argument applies to imaging of synovitis because synovitis is associated with pain, and such a scoring system can enable us to determine the longitudinal change in terms of efficacy of the treatment." Overall, Guermazi believes a great opportunity exists to move on with MRI and to use the growing volume of data to convince the regulators about the importance of MRI as an outcome measure for osteoarthritis in clinical trials. He said the approach must be tailored to phenotyping and choosing the best patient for the specific drug. "Clinically, whenever a patient is in pain, we must first get the x-ray, and if the x-ray shows nothing, we go to MRI. That is what we are going to request all the time," he added. "If we get MRI into play, then probably we will have an algorithm and something that we can base our decision. That is what I say to my colleagues all the time: We are not going to overuse MRI, but we are going to have an MRI for the indication of what will be the best clinical care." Using F-18 FDG PET can facilitate imaging of active metabolism and visualization of bone turnover changes, and PET can show active synovitis, which has been associated with knee pain in osteoarthritis patients, Hayashi noted. To overcome the major limitations of PET, particularly its relatively low anatomical resolution, use of PET/CT and PET/MR hybrid imaging has been explored, and the feasibility has been demonstrated for assessment of early metabolic or morphologic markers across multiple tissues. A: Coronal CT reformatted image shows marked medial joint space narrowing reflecting advanced osteoarthritis (white arrows). B: Corresponding fused PET image shows glucose accumulation around the medial meniscus reflecting focal synovitis (white arrows). 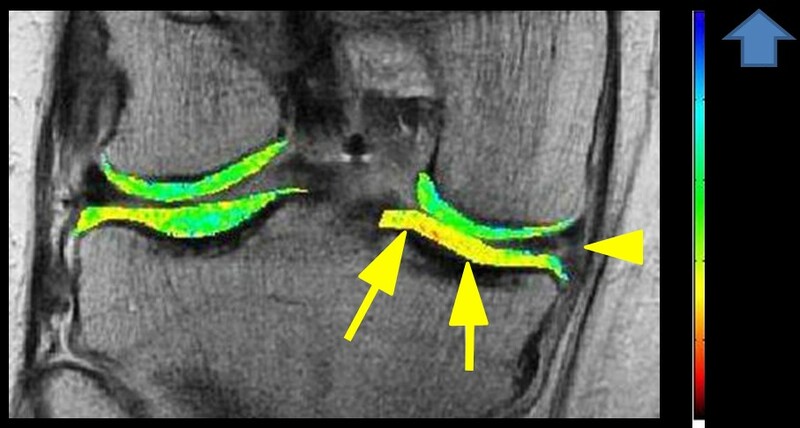 Another focus of synovitis is shown around the posterior cruciate ligament in the intercondylar notch (black arrow). C: Axial CT image in soft-tissue kernel shows distension of the joint capsule, but is not able to differentiate between fluid and synovitis. D: Matched axial PET image shows marked glucose uptake in the medial and lateral peripatellar regions reflecting hypermetabolic active synovitis (arrows). Image courtesy of Dr. Daichi Hayashi et al and BJR. "SPECT/CT is another potential hybrid imaging that can be utilized, and it has been explored recently in the literature," Hayashi said. "But right now these hybrid imaging techniques are not routinely performed in a clinical setting, and available literature evidence is limited. And there are very few studies showing the feasibility of these techniques in osteoarthritis imaging research. For these techniques to be used in clinical practice, there is still a long way to go." Looking to the future in general, personalized medicine and treatment are becoming increasingly important, according to Roemer. "The field of osteoarthritis will be much more complementary than we see today," he said. "We have more and more novel approaches to analyze data, and we are moving on now with increasing computational power and new statistical approaches and modalities. So, for example, bone shape is a very interesting new concept, looking at early changes of bone curvature extracted from MR images." The two aspects are the increasing role of advanced imaging in the routine clinical setting and the exploration of novel imaging modalities, applications, and analytical approaches within the research arena and in clinical trials, Roemer added. "The important thing for all of us is to really understand that osteoarthritis is the disease of the whole joint tissue. We have to move on from the traditional way of thinking that x-ray is enough to see wear-and-tear of the bone and cartilage," Hayashi concluded. "We need additional imaging with MRI, with the complementary information from ultrasound for conditions like synovitis. We need to treat the whole joint." Editor's note: To listen to the whole podcast, click here. To read the authors' original BJR article on which this podcast was based ("Imaging of osteoarthritis -- recent research developments and future perspective"), visit the BJR website.